More childish stuff from the fab four, blessed with a larger budget and an even greater sensitivity. The film is less sinister than before, but the emphasis is still focused on fun and clean humour. Whereas the original latched on to two clear markets (the growing teenagers who first studied the 1984 comic books and the children who adored the family fun of the cartoon), this sequel establishes itself more firmly in the latter camp. It provides dumbed-down action and slapstick, stupid support from a couple of hilariously mutated muppets, and a song and dance finale with a cameo from Vanilla Ice. 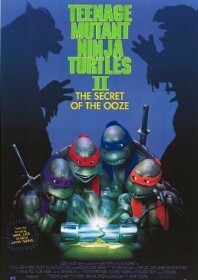 Here they take on a vengeful Shredder and his army of mutants over a canister of special ooze. Fun stuff, and recommended even for older viewers.